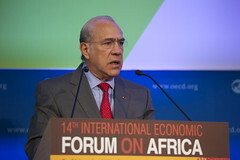 Remarks by Angel Gurría, OECD Secretary-General, delivered at the 14th International Economic Forum on Africa "By Africa, For Africa: Industrialisation and Integration for Inclusive Growth"
It is my pleasure to welcome you to the OECD for the 14th International Economic Forum on Africa – our annual rendez-vous with African leaders, where we take stock of progress and challenges, and identify ways of working better together. This edition of the Forum is called “By Africa, For Africa”. Our choice of title underscores the importance of African citizens, African companies and African governments as drivers of the development process. The OECD is here to listen, to engage, and to strengthen this unique partnership with Africa and its institutions. Our partnership continues to grow from strength to strength: I am pleased to announce that, for the first time, this year’s Forum has been co-organised by the African Union and the OECD’s Development Centre. And by the end of today, our co-operation will be even stronger! After our remarks, Madame Zuma and I will sign a Memorandum of Understanding that will provide a framework for deeper collaboration on issues such as tax revenue statistics, natural resource-based development, and Global Value Chains. The African continent has the youngest population in the world. It is experiencing rapid urbanisation, the emergence of new types of consumers, and the spread of mobile technologies. All of these changes are opening up huge development opportunities. They are raising peoples’ demands for quality jobs, for better public services, for a cleaner environment, and for more accountable governments. These changes are transforming African economies and societies for good. The continent’s output has grown, on average, at over 5% per year between 2001 and 2012. That’s twice the rate of the 1990s, and three times the average of OECD economies (1.7%) during the same period. Growth in sub-Saharan Africa alone is projected at around 5.8% in 2014, with the fastest expansions foreseen in East and West Africa (though these projections will need to be revised due to the impact of the Ebola outbreak). External financial flows are expected to surpass USD 200 billion in 2014 – four times their level at the turn of the millennium. Foreign investment in Africa has now fully recovered and is projected to reach a record USD80 billion this year. Despite the strong growth I have just described, living standards in sub-Saharan Africa have improved less than in other developing regions. Many countries remain vulnerable to volatile commodity markets, climate change and conflict. I returned only a week ago from the UN Climate Summit in New York. It is truly shocking that Africa is the region that is most vulnerable to the effects of climate change. Yet it represents less than 4 per cent of the world’s CO2 emissions from the consumption of energy and less than 7% of total emissions. Vulnerability to epidemics is another major risk. The Ebola epidemic in West Africa ­– with its tremendous human and economic costs – is a stark reminder. Our thoughts are with those people, those communities, and those countries that are affected. The Ebola crisis needs an immediate and large-scale response. But it also underscores quite how important investment in health systems is, if we are to avoid seeing history repeat itself. Like climate change, this is a global challenge that needs a global response. Despite living in an increasingly interconnected world, productivity levels in Africa remain low, and there are too few decent jobs. Every month, 1 million young people become available to join labour markets in Africa. But only a fraction of them finds a job, and even fewer find themselves in high quality jobs. New economic opportunities must emerge to meet the needs and expectations of the growing youth bulge. The key question for us today is: what can we do to help create these opportunities? Integration into global value chains can bring widespread benefits to African nations. The OECD’s work shows the changing nature of trade and investment: splitting up the production of goods and services across countries offers opportunities for firms to specialise in specific tasks and draw their value-added. You don’t need to develop a whole product from scratch to benefit. This year’s African Economic Outlook – once again the fruit of our collaboration with the African Development Bank and UNDP – highlights some promising examples ranging from garment and footwear manufacturing, to horticulture and agribusiness. But it also reminds us of some of the deep-rooted problems that hinder productivity, and in turn hamper job creation. Africa’s role in global value chains remains limited. About 85% of trade in value added takes place within the regional blocks of East Asia, Europe and North America. Africa’s share has increased only very slightly from 1.4% in 1995 to 2.2% in 2011. We speak of “factory Asia”. But I look forward to the day when we will also speak of “factory Africa”. So what can we do to make it happen? First, we should continue to find ways of better facilitating trade. Our estimates suggest that a comprehensive trade facilitation reform would lower trade costs by as much as 17% in sub-Saharan Africa. We should also look more closely at how to make the most of expanding African markets. Exports within Africa have higher value-added than exports to the rest of the world. Despite this, Africa has the lowest share of intra-regional trade. A vast improvement in Africa’s transport infrastructure is needed. Second, we need to sustain and deepen efforts to reform public institutions. In any country, entrepreneurs are most likely to thrive in environments with little or no corruption, and where governments are transparent and accountable. I should stress that these are not only African challenges – they are global ones. In OECD countries, a Gallup World Poll suggests that, on average, only four out of ten citizens have confidence in their government. Third, we need to make sure that Africa seizes fully the opportunities offered by new technologies. These can and should be a driver of green growth. They offer an opportunity to leap-frog, and forge ahead of those regions and countries that are locked into outdated, carbon-intensive technologies. It seems this revolution may already be underway: one recent estimate suggested that more renewable energy projects would be commissioned in sub-Saharan Africa this year than in the past 14 years put together. As a former Minister of Finance, I know that putting in place the right policies is not always easy! But there is good news: there is no copyright on good policies. Countries can and should learn one from another. This is precisely why the OECD will continue to step up its collaboration with African countries and institutions. Last year, from this podium, Prime Minister Duncan of Côte d’Ivoire asked us to help him design a strategy that would make his country an emerging economy by 2020. Senegal then followed with a request for support in the implementation of their Plan Sénégal Emergent. And Togo asked for our advice in designing a more effective education and training system. I am proud to say that we have kept our promises. Our Development Centre has embarked on a Multi-Dimensional Review of Côte d’Ivoire – the first in Africa. The other projects are advancing well too. Ladies and gentlemen, there is no silver bullet. But we can and must do more together – as partners and equals – to promote Better Policies for Better Lives in Africa.